Emotional Support Dogs aid people with mental or emotional conditions, such as anxiety, depression, PTSD, phobias, sleep disorders, and attention deficit disorder. If you suffer from any of these conditions, an Emotional Support Dog could be very beneficial in your day to day life. First, determine where you want to bring your Emotional Support Dog. You may not need an ESA letter in some instances if you don’t plan to bring your dog on airplanes on in housing. In most cases, bringing your dog with you on an airplane or in housing will require an ESA letter written by a licensed mental health professional (psychiatrist, therapist, licensed counselor, etc.) attesting to your need for one. This letter needs to state that your mental or emotional disability will be greatly alleviated by your Emotional Support Animal. In essence, this document is a “prescription letter.” This note authenticates your right to live anywhere with your ESA and travel on airlines together. If you have a therapist, you should speak to them about writing you a letter. The letter should be written on their official letterhead, signed and dated, and must include their license number and the date and place their license was first issued. 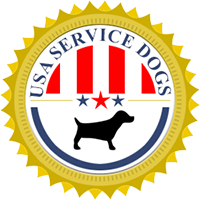 If you don’t already see a therapist or counselor, it’s easy to connect with a licensed mental health professional through USA Service Dogs. On our website, we make it simple to schedule an ESA evaluation and obtain an ESA Letter. Upon approval, our therapist will email you an official Emotional Support Animal (ESA) Letter. According to Federal Law, this ESA letter needs to be renewed annually for air travel but not for housing. Emotional Support Dogs don’t require special training but should have certain characteristics in order to perform their duties and be a reliable support for you. They need to be calm and emotionally stable, obedient in public, and trainable. You must be able to provide adequate living conditions for the particular breed of dog. For example, if you live in a small apartment, make sure you don’t get a big dog who needs lots of space and time outdoors. While your ESA prescription letter legitimizes your need for an Emotional Support Dog, it doesn’t provide visible proof in public settings. Registering your Emotional Support Dog with us provides you with an accredited ID Kit and ESA vest. Your registration will save you hassle and time, as our ID Kits and vests make your dog easily recognizable and help you avoid questioning and hassle in the first place. With your ESA letter, registration kit, and armed with the knowledge of ESA Rules, you will be able to live life accompanied by a gentle, loving animal. You’ll be able to walk confidently, knowing your Emotional Support Dog is there for you. Additionally, you won’t be hassled about “no pets” policy housing. According to Emotional Support Dog Airline Policies, you’ll also be entitled to ride in the cabin of aircraft with your dog at no additional cost to you.